So-called “purely positive” training is a huge new fad. It means you only reward your dog’s good behavior; you never correct the bad. 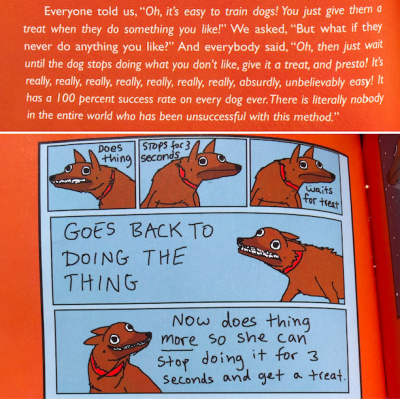 Most purely positive trainers are what I call “treat-focused”, centering around giving the dog edible treats at the exclusion of other more readily available, natural, and fulfilling rewards like offleash play, pets, praise, socialization and so on. If you’ve read pretty much any of my writing, you’ll know I’m a vocal opponent of the treat-focused, purely positive fad. Much more is needed to raise a calm, peaceful, happy, respectful, obedient pup. Below is a succinct, humorous, yet spot-on summary of the frutstration many owners find with purely positive training. I’ll let the cartoon speak for itself. Find it in a hilarious book called Hyperbole And A Half (pp. 88-90), by Allie Brosh (for more info goto http://hyperboleandahalf.blogspot.com). I am near my leash end with a 9 month standard poodle. We walk an hour every morning since he was small.It true i make him come or sit, or wait for cars rewarding with a treat. Yesterday he bit a jogger, today we walked 20 minutes with a chock chain, when we went off leash, he turned and attacked me biting on my wrist drawing blood. I have emphasized “heal” every morning while on leash. The chock chain I tried a month ago making him very angry and difficult, so I went back to a leash on his collar. I tried the chain again this am. My oh my . . . This dog is approaching full maturity and will become more dominant and aggressive without a consistent daily routine of leadership, obedience work, boundary-setting, and muiltiple exhausting and fulfilling physical and social outlets offleash in the dog park with other dogs. Thanks Angad! Always nice to know I’m connecting with people. All I really want is for your dog and you to be happier together!